Clemson's A.J. 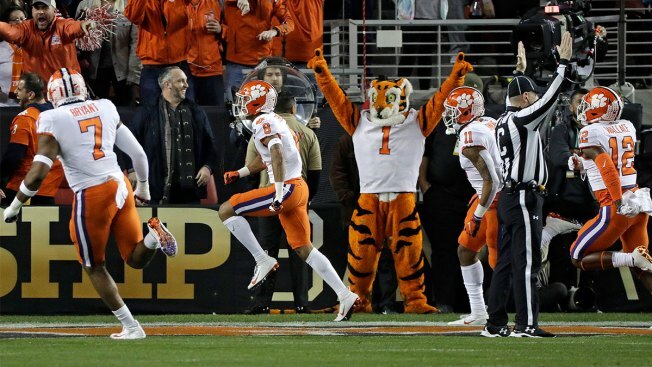 Terrell reacts after intercepting a pass and returning it for a touchdown during the first half the NCAA college football playoff championship game, against Alabama, Monday, Jan. 7, 2019, in Santa Clara, Calif.
Dabo Swinney kissed the championship trophy and proclaimed this Clemson team the greatest of all time. With stunning ease — and a freshman quarterback — Clemson toppled college football's greatest dynasty again to become the first perfect playoff champion. Trevor Lawrence passed for 347 yards and three touchdowns and the second-ranked Tigers beat No. 1 Alabama 44-16 on Monday night in the College Football Playoff national championship game. In the fourth consecutive playoff meeting between the Tigers and Tide, Clemson evened the series and beat 'Bama for the national championship for the second time in three years. Clemson is the first college football team to finish 15-0 since the 1800s, and the first team since the playoff started five seasons ago to get through a season unscathed. "I mean, our guys had the eye of the tiger, but I'm so proud, and then for our seniors to be able to go out 15-0 and truly be the best ever — there was a lot of talk about best ever all year long," Swinney said, talking about Alabama. "We were never in that conversation. But tonight, there's no doubt. First 15-0 team, to beat Notre Dame and to beat Alabama to do it, this team won 13 games by 20 points or more and led by an unbelievable group of seniors, amazing group. I'm just thankful to be a part of it." Alabama coach Nick Saban and the Tide (14-1) were looking for a sixth national championship in 10 years, trying to add to an already unprecedented run in the sport. Instead, Clemson crushed Alabama, becoming the first opponent to beat the Tide by more than 14 points since Saban became coach in 2007. Swinney's Tigers sealed their status as a superpower, no longer just 1A to Alabama's 1. "We're 15-0, we beat the best team ever, nobody's taking that away from us," Clemson All-American defensive tackle Christian Wilkins said. Two seasons ago it was Deshaun Watson dethroning the Tide with a last-second touchdown pass. Clemson's new star quarterback didn't need the late-game heroics. The long-haired Lawrence cut through Alabama's defense with the help of another fabulous freshman. Justyn Ross made a juggling grab, a one-handed snare and broke a 74-yard touchdown about midway through the third quarter that made it 37-16 and had Swinney high-stepping down the sidelines. Ross, who scored two touchdowns in the semifinal rout of Notre Dame, had six catches for 153 yards against his home-state team. Swinney takes a different approach than Saban, running a more fun-loving program than Alabama's all-business organization. But the results have been every bit as good. And on Monday night at Levi's Stadium, in a championship game played more than 2,000 miles away from Clemson's South Carolina campus, the Tigers were way too much for an Alabama team that had spent the season mauling its opposition. The Tide won their first 14 games by an average of 31 points. Alabama's Tua Tagovailoa threw two crucial interceptions in the first half, the first returned 44 yards for a touchdown by A.J. Terrell to put Clemson up 7-0. The Tide came in scoring 48 points per game, but was shut out over the final 44 minutes by an opportunistic Clemson defense. Saban lamented numerous mistakes: blown coverages on third down (Clemson was 10 for 15), stall outs in the red zone and special teams mishaps, including a fake field goal that flopped on the first possession of the second half. He laid the blame on himself. The Alabama program has set a championship-or-bust standard under Saban, but he didn't want this season looked at as a failure. "One game doesn't define who you are," Saban said. "But I also told the players that sometimes we learn more when things don't go well, when we lose." Tagovailoa, the sophomore who came off the bench to win the championship game last year for the Tide, went 22 for 34 for 295 yards and two touchdowns. "We had a great season, but five words: Good is not good enough," Tagovailoa said. "We didn't finish the way we wanted to finish. We didn't do the things we needed to do to execute and be successful in this game, and that's all it is." The Heisman runner-up was also the second-best quarterback on the field in the championship game. Lawrence finished 20 for 32, and went 18 for 25 for 277 yards over the final three quarters. The teenager who took over as the starter four games into the season raised the Tigers' play, giving them an explosive offense to match a suffocating defense, led by All-American linemen Clelin Ferrell and Wilkins. "Just these seniors, just taking me in, and they kind of dragged me along until I got my feet under me, and they just — they're awesome people as well as players," said Lawrence, the first freshman starting quarterback to lead his team to a national title since Oklahoma's Jamelle Holieway in 1985. Clemson hit Alabama with a 31-point first half, capitalizing on the Tide's mistakes and unleashing Lawrence's rocket arm. Tagovailoa threw a second interception in the second quarter, this time into triple coverage, and Trayvon Mullen's 46-yard return put Clemson in Alabama territory. That led to Travis Etienne's third touchdown of the half, a 5-yard shovel pass from Lawrence. With a chance to stamp itself as the best team in Saban's remarkable 12 seasons at Alabama, the Crimson Tide played maybe the worst half of the coach's tenure. The 15-point halftime deficit was the largest the Tide has ever faced under Saban. Alabama seemed panicked in the third quarter, running a fake field goal into a waiting Clemson defense instead of kicking from 40. Three plays later, Lawrence faced down a pass rush and slung a pass to Ross, who was alone after Alabama defensive back Saivion Smith went down with an apparent leg injury. Ross sprinted away and the shocking rout was on. Almost as shocking as Clemson, a program that promoted an obscure receivers coach to lead the program 10 years ago, climbing over the traditional powers to the top of college football. Clemson finished No. 1 in the AP poll for the third time. "Our goal is not to win a national championship. People don't believe that. Our goal is to win the closer right there. The national championship is just a byproduct of that. It's never been my goal," said Swinney, who now has as many titles as Hall of Famers Bobby Bowden and Joe Paterno. "I don't measure teams by that, and I know we've got some rabid people that that drives them crazy, but I measure our team based on did we get better, did we reach our potential."